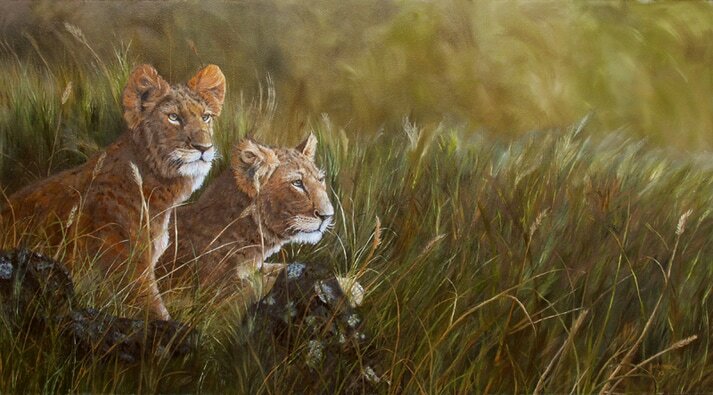 Giclee fine art paper and canvas prints from my original oil painting of a pair of lion cubs anticipating mom's return. While I was on safari in Africa, I had the pleasure of watching a pride of lions with there cubs getting into position for the hunt. The cubs sat side by side and intensely watched the females as they went for the kill. Since this was the first time I had ever witnessed a pride of lions working together for the chase, but I was amazed watching how the cubs sat so still watching ever move the females made. ​​If you do not see a size you are looking for or for more information, contact me!